Gulfstream Controls installs and services Automated Logic products. Automated Logic has long been known for its intuitive, powerful front-end building control software. In fact, ALC pioneered graphical programming in the industry. With its graphical user interface, users have such features as hierarchical scheduling, thermographic color floor plans, trending, alarm management, and reporting. And with WebCTRL®, our web-based building automation system, all of these features are available through a standard web browser - without any special software or plug-ins. Automated Logic's WebCTRL is a premier building automation system, offering an intuitive user interface and powerful control features. The potential of WebCTRL is universal – literally. It enables you to access your BAS from anywhere in the world through a number of devices – including desktop computers, laptop computers and tablets and cell phones – equipped with Google™ Chrome™, Internet Explorer® v8 or later, Mozilla® Firefox® v21.0 or later, Safari® (Mac Only) v6. And with no need for add-on software. 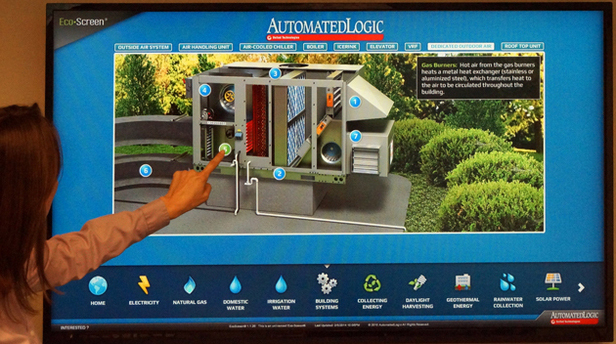 Automated Logic's Eco-Screen sustainability kiosk is a powerful tool that enables building owners to showcase their propertiesí energy conservation and sustainability measures. By hosting Eco-Screen on a large touch screen kiosk in your facility's lobby or common area, you will introduce visitors to your buildingís sophisticated operating systems, providing the public with an interactive and dynamic presentation of your building's most innovative green building features. Time-lapse is a revolutionary new feature within WebCTRL that allows operators to roll back time, up to a 24-hour slice, and play back hours of real-time data in just minutes. This innovative feature provides a quick, visual indication of any problem areas and gives facility managers a strong diagnostic tool to quickly identify and correct issues that impact energy efficiency and comfort. 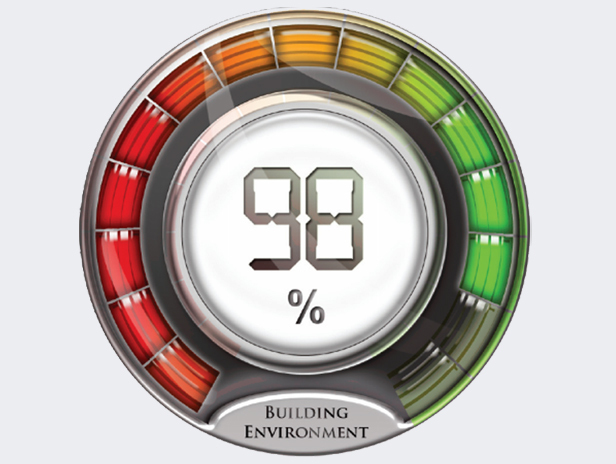 Automated Logic's Environmental Index provides a simple and effective solution. Starting with temperature as a key component of comfort, the Environmental Index (EI), expressed as a percentage, reflects how close the zone temperature is to the effective heating and cooling setpoints. Accessed through a browser using WebCTRL, the EI is shown on an easily read analog gauge, using the red segments to indicate poor environments, and graduating to green as conditions improve and the EI begins to approach 100%. 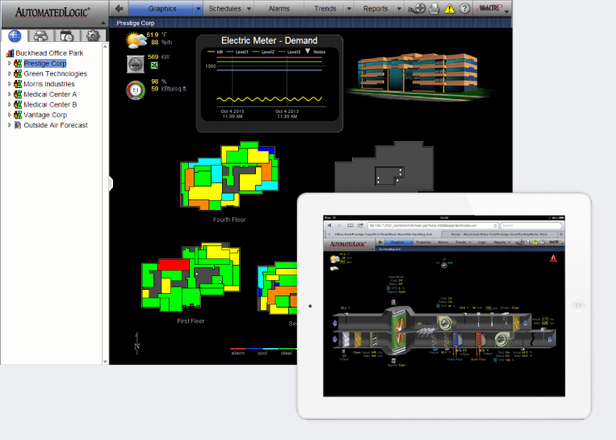 Automated Logic's EnergyReports™ is a flexible, easy-to-use reporting tool that enables facility managers to produce a wide variety of reports showing a building's energy consumption. 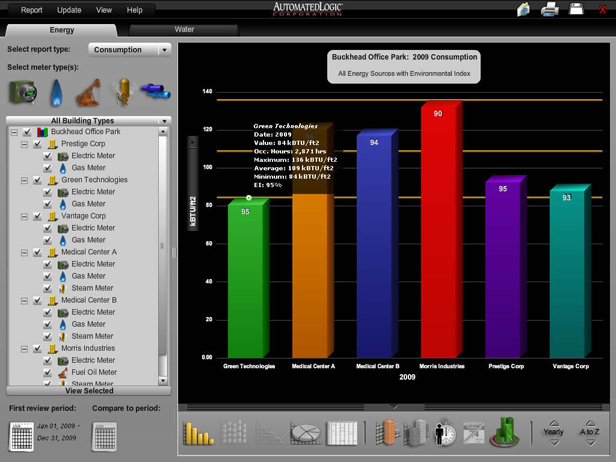 Using color graphs, EnergyReports allows users to compare energy consumption or demand over different periods with simple drop-down menus and calendar control options. This gives facility managers a powerful tool to minimize energy consumption, maximize comfort, and achieve sustainable building operations.